Although my site is about Euro Coins, I assume many who are interested in the coins will also have an interest in peripheral issues such as Euro Bank Notes, paper money value, events leading to the introduction of the Euro, countries intending/wanting/waiting to enter the Eurozone etc. and so you have here a page with a few particulars pertaining to Euro Notes. You will notice that the images displayed all have "specimen" printed across them. Because of the problem of forgery it is difficult to obtain permission to display "clean" images but for the purposes of the page the images displayed are, I think, adequate. Front side: Windows and Gateways which are supposed to symbolize the European spirit of openness and cooperation. Reverse Side: Bridges which are supposed to symbolize communication between the people of Europe as well as between Europe and the rest of the world. The images are deliberately designed not to represent any actual structures and are thus not country specific. The differences between the various designs are in the type of style. 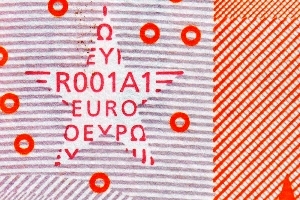 The 12 stars of the EU are shown on all of the notes. The initials for the European Central Bank appear in 5 different forms: BCE,ECB,EZB,EKTand EKD.These forms cover all of the 11 offocial languages of the EU. A map of Europe is shown. 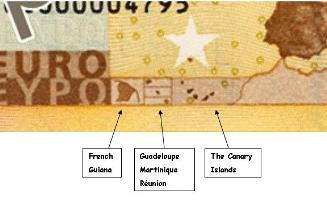 In the left of the bottom bar on the reverse side are some boxes in which are depicted the various overseas territories that have the Euro as their official currency. See EUROZONE for a full list of these territories. All Euro Notes bear the signature of the president of the European Central Bank. You can approximately date your note by comparing the signature on it with those in the following table. Table showing the Presidents of the European Central Bank, their date of tenure and their signatures. One is sort of hidden - in the Euro stars on most notes but within a small rectangle to the left of the Euro stars on the 5 Euro Note. This is a 6 character alpha numeric - a letter followed by 3 numerals followed by a letter and finally a numeral. The initial letter identifies where the note was printed. The following 3 numerals identify the printing plate used. The next letter identifies the row on the printing plate. The last numeral identfies the column on the printing plate. 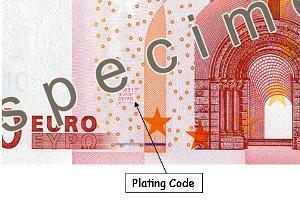 Each Euro Note has a unique serial number. This is a twelve character alphanumeric with a leading letter followed by 11 numerals. The leading letter shows for which central bank the note was issued. (National identification Code). Note: a bank note issued by a specific National Bank could well have been printed in another country. Portugal M U Valora S.A.
From the above table you will see that some countries - France and Germany use two different printers while other countries - e.g. Luxembourg and Malta - do not print any notes. The design of the Euro Notes ( as with the Euro Coins) was completed after consultation with organizations representing visibly impaired as well as totally blind people. All the denominations are of a different size, increasing in size from the smallest (5 Euro) to the largest (500 Euro). Certain features were included to enable those with sensitive fingers to distinguish between the denominations. The measures taken to thwart the efforts of counterfeiters are legion - at least 30 have been made known by the authorities or discovered by individuals but there are still others the nature of which is kept secret. To look at these more closely falls outside of the scope of this site but here is a link to an excellent article in Wikipedia which covers the measures against counterfeiting in greater detail and from which I in fact got much of the material for this page. Return fron Euro Bank Notes to Euro coin Collector.